Artistic Insight: On 11 January 2016, the Guildhall Art Gallery will be hosting a talk by Denzil Forrester, one of the exhibiting artists at No Colour Bar: Black British Art in Action 1960 – 1990. A dynamic painter, Forrester rose to prominence in 1980s Britain, depicting all areas of late-twentieth century London life – from dance halls and carnivals to the deeper nuances of urban society. To tie in with his talk, this article explores his artistic history and style. To reserve FREE tickets for the talk, click here. Forrester was born in Grenada in 1956, moving to Britain with his family, aged ten. He was one of a handful of artists to graduate with an MA in Fine Art (Painting) from the Royal College of Art, after studying at the Central School of Art and has had a dynamic career at home and abroad, currently lecturing at Morley College. Denzil Forrester’s kinetic and vibrant paintings evoke soundscapes, dance halls and the urban life of London. His bold forms overwhelm his canvases, building up rich tapestries of movement and kaleidoscopic light. His paintings, often stricken with strobe, evoke pulsating masses of people and movement, notably imaging the 1970/80s emergence of dub music and dance in London. While his work evokes the undulating shadows and limbs of the Harlem Renaissance or the vivid prismatic angles of German Expressionism, Forrester’s distinct style bares witness to the vibrancy of Black British culture in the 1980’s. His large-scale works confront the senses and evoke memories of music, are best seen in situ – photographs do their dynamism little justice. Whilst Denzil envisages electrifying scenes, encapsulating the temporal and ephemeral space of young Londoners, he also subtly images the social tensions of the time. 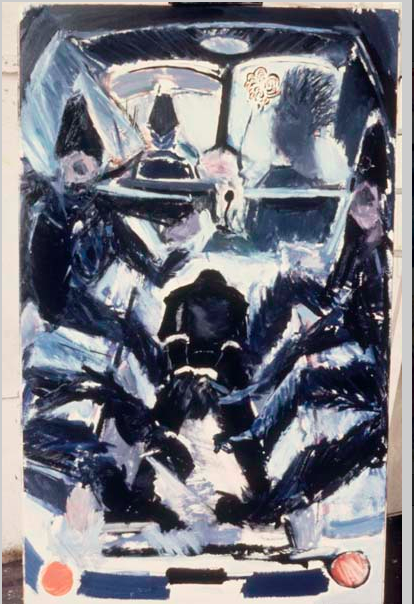 ‘Police in a Van’, a oil painting on board (1982), originally featured in a 1994 exhibition at The Storey Institute, Lancaster, called ‘Us an’ Dem’, exploring the tense relations and anxieties between the police force and the Black community. This dark and voyeuristic painting shows a distorted aerial view of police officers in a van, their angular and furiously scribbled cobalt blue legs jutting into the centre of the painting, drawing attention to the shadowed figure flattened on the floor. Forrester creates a painting rich with psychological intensity, the faces of the subjects blurred or concealed, focusing on the brute force of the police and the submission of the body. This painting, however, does not suggest a particularly unusual scene. The police drive forward, focused on the road and the police legs are uniform and regular, save the raised foot in the upper left-hand portion that jarringly reveals the true violence of the painting. What is haunting about this piece is the form in the centre, faceless and completely flattened, so much so it could be mistaken for a shadow. Forrester’s ability to lend his bold use of colour and light to such works exploring police brutality as well as the liveliness of the urban musicality evince Forrester’s complexity of theme and characterisation that has extended throughout his career. s, as autonomous as colour or form. As suggested by Eddie Chambers, his work also betrays an affinity to the kinaesthetic animation of colour of Italian Futurism – though it seems that Denzil had established this style before a possible exposure in his time in Italy. 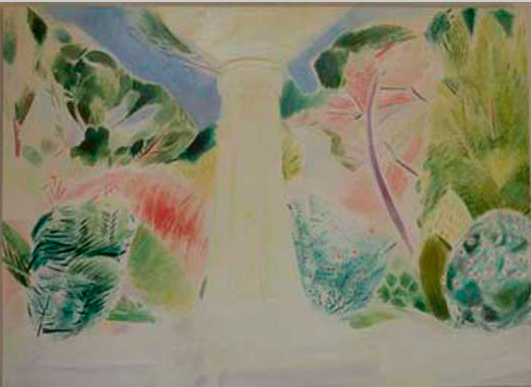 Denzil Forrester will be talking at the Guildhall Art Gallery from 12.30 – 2.30pm on Monday 11 January 2016. To reserve FREE tickets to this event, click here.